​You had one job, Jason Witten! You literally had one job. After Bears linebacker Danny Trevathan forced a late fumble against the Seahawks on Monday Night Football, the tight end-turned-analyst had multiple chances to get the player's name right. And he failed. Come on, Jason! Your booth partner, Joe Tessitore, literally JUST got done saying it. And he did it correctly. Be more like Joe and less like yourself. Of course, Trevathan later found out about this. And he wasn't overjoyed about it. 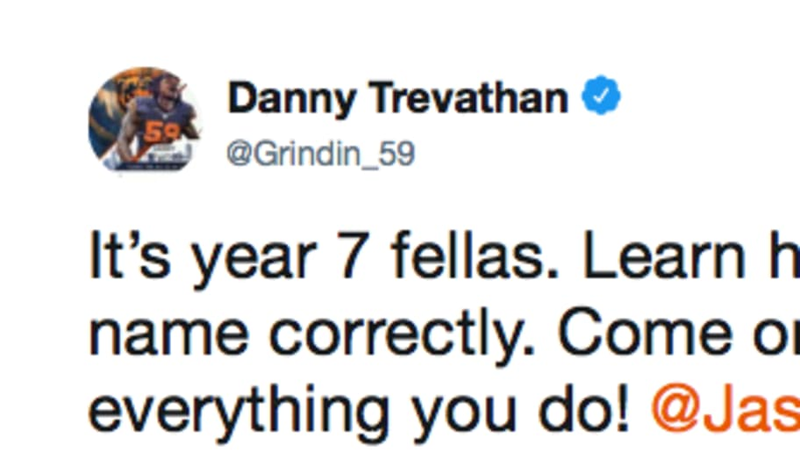 Trevathan isn't some new kid on the block. He's 28 years old. He won Super Bowl 50 with the Broncos. Witten must have played against the guy a few times over the years. Oh, well. ​Sounds like par for the course for ESPN.